Actually, that should be, "...I said!" Several days ago I simply ran out of steam on my Olympic sweater, a bit shy of finishing the left front (which was the first piece I started). 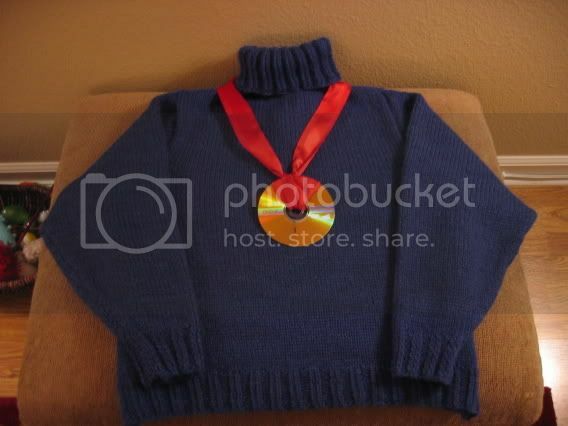 I would have liked to make witty and valiant remarks about how I'm volunteering to be last, so the rest of you can win gold, or how it's the trying not the winning that counts, and other such blather, but in reality, I didn't like knitting the sucker. Plus, I'm wicked overloaded at work and my tummy aches in a viral sort of way and I don't have a TV to watch the Olympics on and my hands ache and tingle when I knit and whine, whine, whine.... but, naaa, I just quit. Poop, I say, with conviction. 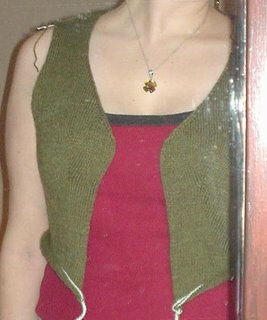 On the bright side, I picked up a WIP-pish raglan sweater again, after I've left it hanging for years. Years, I say! How many years, I don't know, except I know I bought the yarn in 1999 (receipt's still with the yarn; that's how I know). I'm damned close to finishing the decreases towards the top, which means only the neck shaping and the collar to go and I'll be done! Woot! 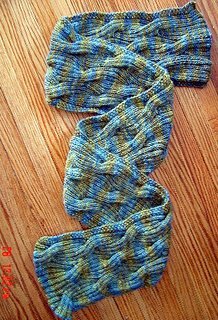 And I bet I'll have enough of the lovely Berroco Europa wool/cotton yarn left that I can make myself wristwarmers, which I need. So perhaps by Sunday at (what time does this nonsense end?) I'll have myself a lovely new sweater, which may even fit, and quite possibly a pair of wristwarmers. I never was much of a team sports kinda person, anyhow. But you all out there - keep it up! You're doing great! Just four more days and you'll be a winner! If you're not already! 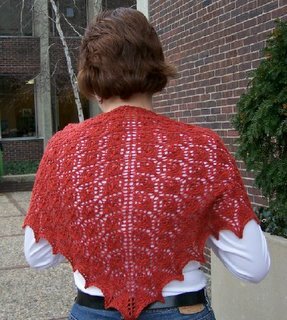 And if you don't finish in time, console yourself the way I did - ordered myself some Kureyon and Schaefer's Little Lola from Little Knits. Almost as good as gold. Which is a color I look lousy in, come to think of it. To all of you with the finish line in sight . . . go, go go! As for me, I'm not sure where I'll end up. I've been sidelined by a nasty chest cold that kept me in bed almost all weekend and all day yesterday. Felt well enough to do a little knitting last night, then attempted going to work this morning. That was a mistake--I was back home in bed by 2 pm! 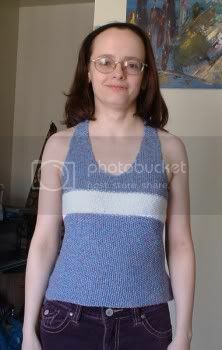 I'm going to watch the women's figure skating now, and hopefully get a couple more inches of my vest knit. And then we'll see what tomorrow brings. That's only a little over 150 stitches needed per hour. No biggie, right?! I see by the Harlot's countdown clock we have 4 days and some 20 hours. I'm exactly 1/10th into my Olympic Wrap. I got distracted, to say the least. 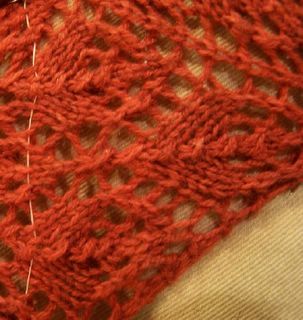 Tomorrow I will put it back on the needles and hope nobody noticed the roids (ster, not hemm) while I do my best to get 'er done. All these Olympic FOs already! Sheesh! I should have been more faithful to the sweater... I'd not be worrying about not finishing if I had been! But it's turning out well, one more sleeve and the hood to go. Oh, and finishing, which I've never done (well) and really want to shine. So, fingers crossed for the finish line! Man all of that 1x1 ribbing at the end. I thought I'd never finish. I was saying "knit, purl, knit, purl, knit, purl" in my sleep! I once said I would *never* knit a pair of socks... I officially eat my words! In fact, I am now addicted! 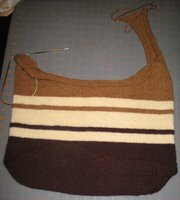 I couldn't decide on the purse pattern, so I got started on the sweater. I went about five rows, decided that I'd mucked something up and frogged it. Then I started over. It's moving along, but I'm concerned. The pattern didn't have anything about yardage on it. I had three skeins of coordinating TLC yarn from ages past. (It's so old, it doesn't even have anything for the name except "TLC"!) Now I don't know if I'm going to have enough. I can't even find anything on the Net that looks similar. Baby blankets are the worst! 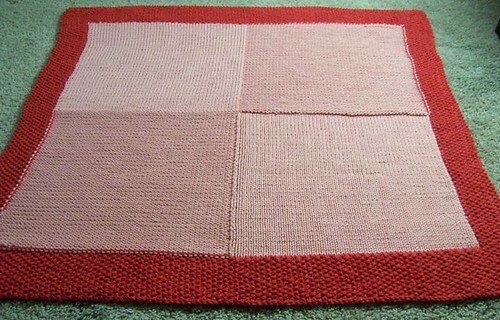 I'm slowly plodding along with my Big Bad Baby Blanket. 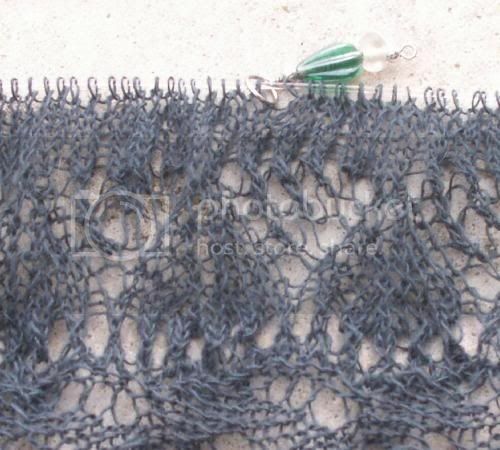 I really like working with Knit Picks Shine, even though it's cotton. I'm afraid I didn't order enough red, so I placed an order yesterday for a few extra skeins. I paid extra for quick delivery so hopefully it will arrive in time for my Olympic finish! Okay, so I've been a big-fat-Olympic-lurker. I really have been working toward my Olympic goal - I just haven't had much knitting time until the past few days... but the games are not over yet! Here's the first look at Twisted Sisters' Eve, a ribbed reversible cable scarf. Knit in TS's Petite Voodoo (50% silk 50% merino). Since this photo was taken last week, she's been frogged, restarted and is now progressing quite well. (I decided to move down a needle size to US5). 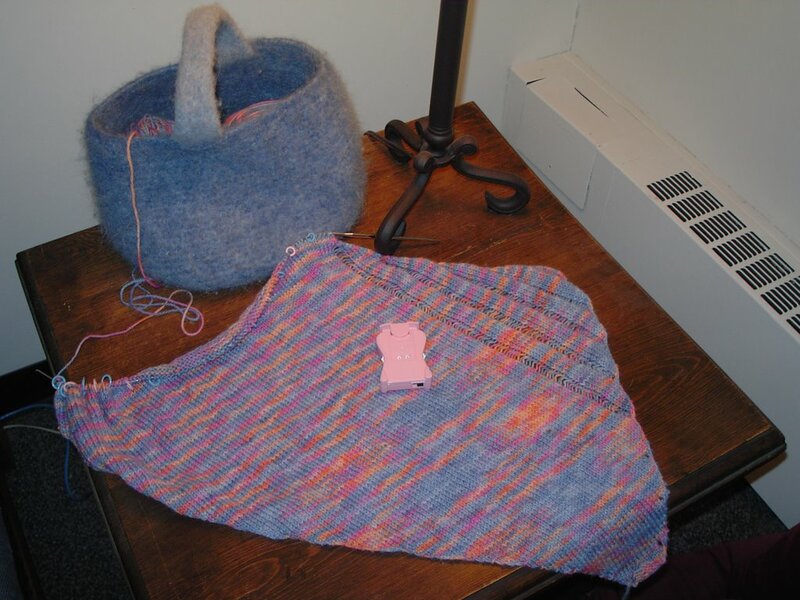 As I'm a pokey knitter, I should get back to work on her... Plus the Women's Bobsled competition (one of my faves) is on right now, complete with a big wipe-out run, so there is be no better time to knit Olympic style. Knit on! Everyone has such beautiful projects! 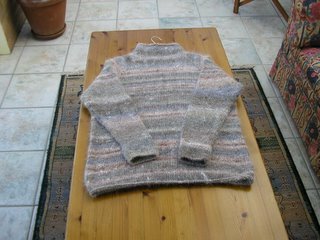 I finished the body of my sweater last night, have 2 partial sleeves and then I have to put finish it and add the turtle neck. so...last week, i couldn't knit for two days due to school and work. and then i had marathon knitting friday night and sunday night in front of the Olympics. gotta love that ice dancing! 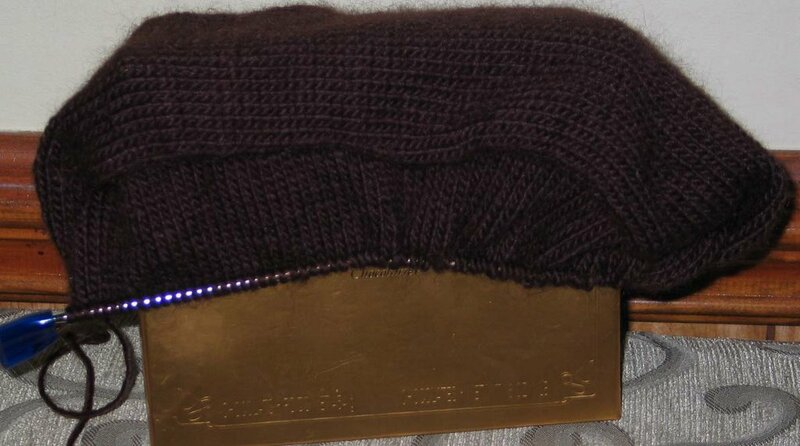 this allowed me to entirely knit the front piece of my sweater. this morning on the train i cast on for sleeve 1. more endless ribbing, but hey, at least it is 30 sts less than the body pieces, so it shouldn't take as long, even though it is 3 inches longer. grrrrr. i think i will get done. it really is turning out to be a challenge though. Color me the cross-country skier who finishes three days after the rest of the pack. 'Cause that's the way this sweater's coming down. After spending Friday evening making spectacular progress (for me, anyways) on a sleeve, Saturday found Tubey hitting ye olde frog pond with a most spectacular splash (earning a 9.5 from the Slovak judge). Why? Because my befuddled brain lost the ability to make mathematical comparisons. Specifically those regarding measurement. Nothing that can't be easily fixed, mind (in fact, it already has), but it was time spent in repair that should have been spent otherwise. Though this Encore's making a lovely fabric, so I WILL finish. And maybe, when I have enough to make it worth taking a picture of, I'll include one! I'm at about 50% right now. I would be worried, but the reason I'm only at 50% is that I haven't been entirely faithful. I kind of finished my Jaywalkers. Oh, and I knit to the heel flap on my Conwy sock. 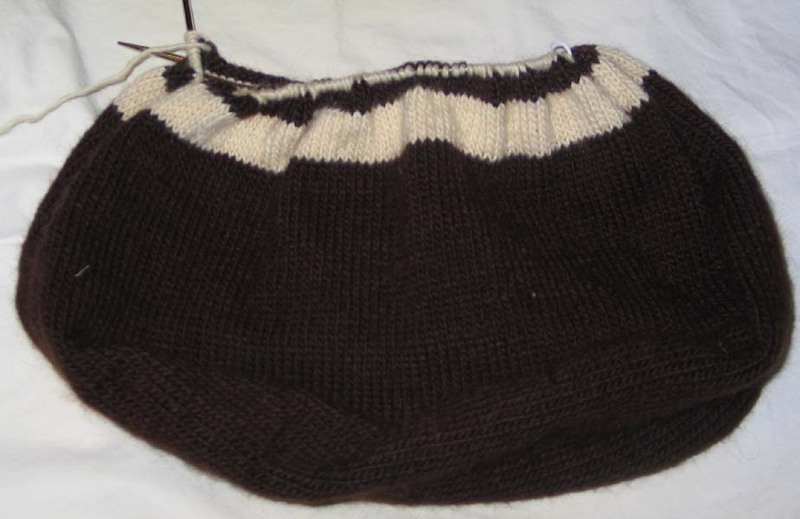 And I'm sort of almost done with the back of a sweater. Finished my project this evening! I still need to try and block it, though it's acrylic so I don't know what good that will do. The bottom hem curls a lot, thought the collar sits beautifully with no coaxing. 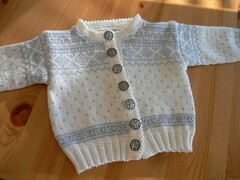 I loved this pattern, and I may make a matching sweater for my daughter's doll with the ball I have left over. 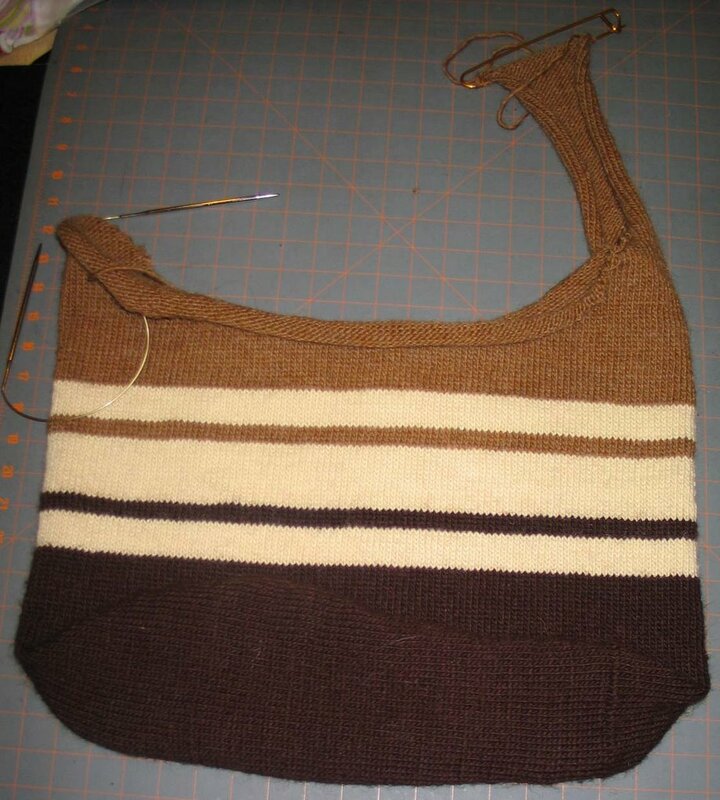 Perhaps she'll even get a similar sweater, this pattern was SO easy and had almost no finishing, a dream for me! (full progress photos on my blog, by clicking the photo.) I'm about halfway through ball 3 of 5 skiens of yarn. The pattern is starting to go more quickly, as I'm not looking at the pattern every 2 seconds now on the more complicated rows. I like how it is the color and abstractly the pattern in the Torino Olympic Logo. That was a happy accident, as I hadn't seen the logo until after I piced my color and pattern. The second sock is now past the heel. I only have 2 or 3 more lace repeats before I start the ribbing. I LOVE this pattern! 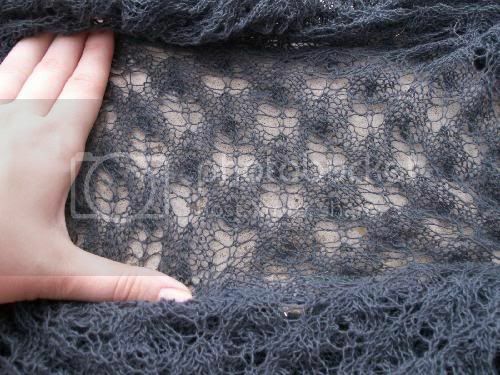 I'm a big fan of toe-up sock knitting, and I now see how people get addicted to lace knitting. Combine the two, and I may be in trouble. This pattern is easy and has a neat effect on self-striping yarns. Have plenty of yarn...about to storm here, next 2 days off...stocking up on food and supplies...the best part, if we lose electricity..so what...don't need it to knit! Best of luck to everyone! To the ones who have finished, awesome...to us still plucking away...still awesome..We Can Do it! Rah! Would you feel sorry for a member of the ski team if she travelled to Turin without her skis? Probably not. But I'm still hopin' for some sympathy. This is a long weekend away from home in which I know I'm going to be able to get a lot of knitting done. I pack carefully--extra balls of yarn for all that progress I'm going to make (check), needles (US 5 circs in two different lengths--check), pattern (check), dang I'm doing good. In car on way to airport, I realize that I don't have my contrasting color yarn. It's Debbie Bliss wool cotton. Right, you read that correctly, a discontinued yarn. I'll never be able to get a ball to replace the one I left behind. My SIL is unable to Fedex me the ball (and yes, I was willing to pay for Saturday delivery to get it). I'm stuck, only 1/4 finished on my sweater(and unable to make any more progress) until I get home on Monday. I considered flying home to get this ball of yarn. I want to cry. Carry on, knittyheads, carry on for your fallen team mate (who still hasn't given up on a late push for the finish line). I put my Happy Vest on two circs a few minutes ago and tried it on over the shirt I plan to wear it with. Perfect fit! 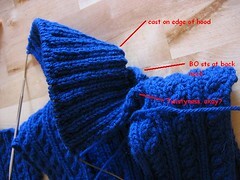 And I like this ribbing much better than the ribbing I used on version #1. So now I'm glad I started over. I plan to get a LOT of knitting done today, because I'm too sick to go anywhere. Fever, chills, aches all over, sore throat, horrible cough. But this cold won't stop me - I'm staying the course. Go team! I seem to have fallen over part way through and am struggling to get up and carry on. My cardigan was going very well, but the apres-ski got a bit too tempting and I've been partying in the village instead. The progress so far, you'll have to excuse the dodgy photo (and my smeary mirror). 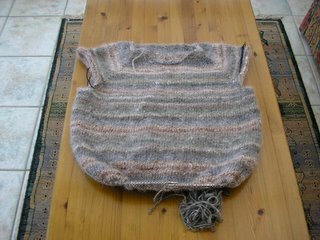 The top half of the body is complete and I've made a start on the sleeves. Once I've done those I'll turn it around and work the other way to shape the bottom. I'm not quite sure how it will work, but you can see the sketches on my blog to see what I'm aiming for. It's going to be a desperate scramble to the finish line. 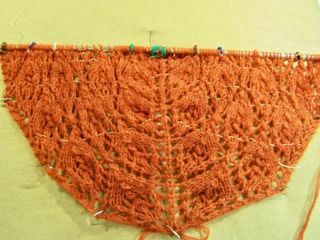 Tonight I started the last main pattern repeat of the Flower Basket Shawl. My ball of yarn left over still seems kind of huge. Even though my LYS owner weighed and estimated and warned me not to drop in any more pattern repeats, I think I'm going to anyway. Look at all that yarn. 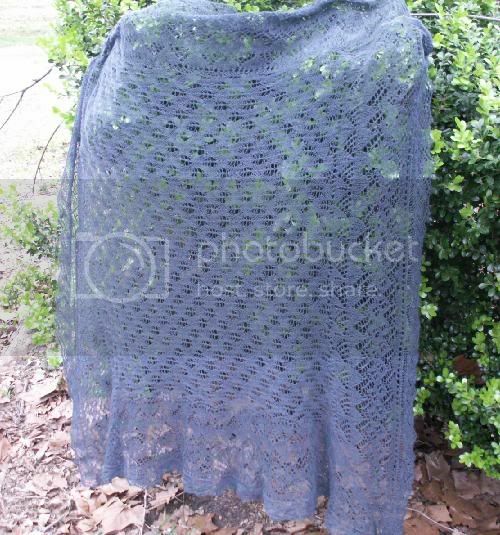 (I need something nicer then a dishcloth for a backdrop someday). So I figure I can either stop now and finish several days early, or push on for at least 1 more repeat. 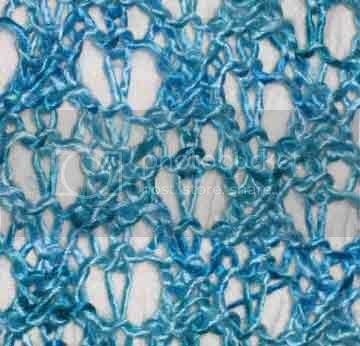 Then I'd be rewarded with the smidge longer shawl I really desire (only 1 repeat adds more then 2") and I get to maximize my precious handdyed. If it doesn't work out, I can always lifeline and rip back, and still finish on time. I'm impressed at all the folks who are done, espcially those super-humans who have knitted an entire sweater in a week! I feel like one of those Olympians that nows that they have no chance of winning but who are just thrilled to be in the same contest with the superstars. Y'all amaze me! that some of my esteemed Knittyboard teammates are DONE with their Olympic knitting? Why, yes, I could be. The sweet story is here. Now you understand why I can't recount it in more than one place. 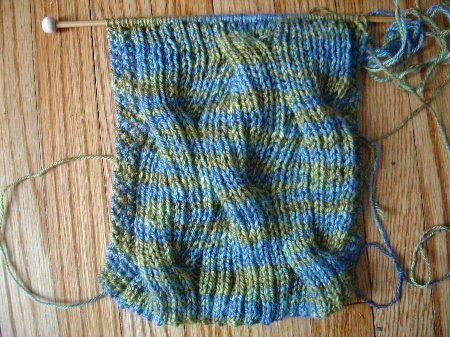 Here's proof that I am knitting a Clapotis for the Olympics. And knitting on despite complete CRAP equipment (the lovely pink locking row counter pictured does not lock, in fact, I believe it's programmed to move ahead when you lock it). I'm persevering in the face of adversity, just like Lindsey Jacobellis. I'm nearing the end of this sweater. 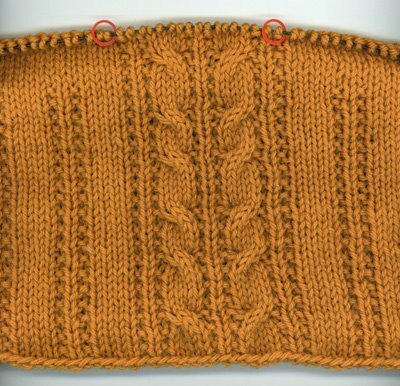 I started the placket neck part, so not much more knitting, then just the underarms to seam. I LOVE knitting in the round for the lack of seaming!! Made the back of Tubey and worked on both sleeves for a bit so I could try it on. Thoroughly disheartened, I swatched 2 yarns in 3 sizes and started making a Pure and Simple Top Down V Neck sweater. 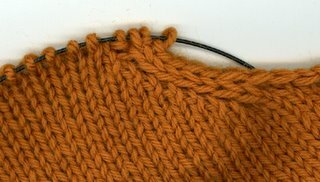 I debated switching patterns all Tuesday night and finally decided it wasn't cheating since I only signed up to make Ye Dreaded Sweater, not any particular pattern. So I have only CO for this late Wed. afternoon, will have to be the Knitting Ninja or some other knitting superpower to get it done. 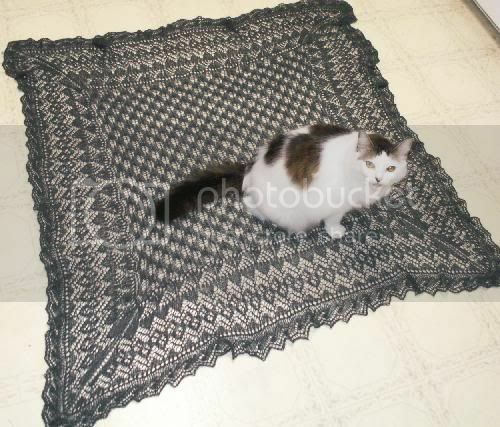 Why did I think the sportweight yarn looked the best? I am beginning to see the appeal of big yarn and big needles. 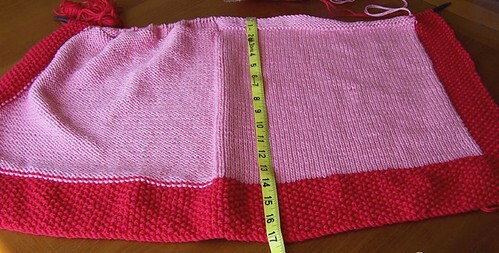 I will make Tubey at a later date, thinking it over while knitting the 'new' sweater I can see what I need to do to make it fit. And may I just say - Wow, reluctantmango! You go, girl! Here's the first hank of yarn for my Knitting Olympics project. Now for a slew of adjectives: it's 2.5 ounces of hand-carded spindle-spun heavy worsted 2-ply woolen natural shaela shetland. I used my homemade mini cd spindle and it worked well. I cast on for Spinderella's Felted Mittens using size 11s and mitten the 1st looks good so far. 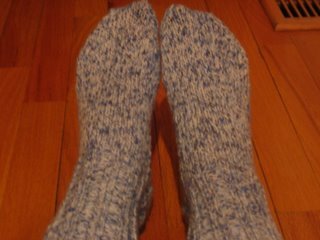 Check out the bloggity-blog for progress on the socks! I am ready to work the heels and then I am on the home stretch! Since I haven't posted since before the Olympics began, I thought I should check in and prove that I am making progress. I did have a few setbacks along the way. First, I had a last minute substitution of a team member, so to speak. At the last minute, I freaked out and decided that if I used the alpaca yarn from my stash that I was planning to use, I would be cutting it too close in terms of having enough yarn to finish. So a Thursday evening trip to the LYS resulted in the purchase of four balls of Lily Chin's Chelsea yarn. Crisis averted. My next setback was that Friday turned out to be busier than I had expected, and I didn't have time to do anything more than cast on. Actually, the whole weekend was busy, so I didn't really have any time to devote to knitting until Sunday night. 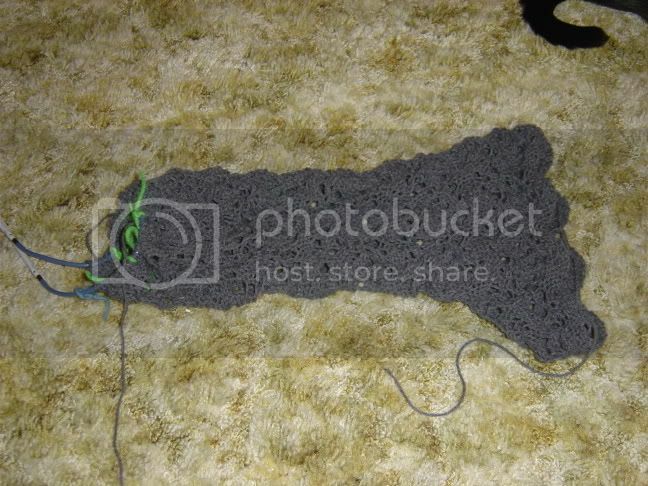 I began knitting the first row of the pattern, and the connector on the cord of my Denise needle broke! So I transferred the stitches to a new cord, and I was finally on my way. 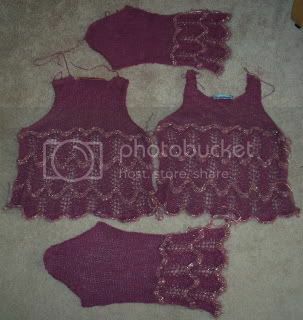 Well, I finished the major knitting last night - we have a front, a back, and two sleeves. 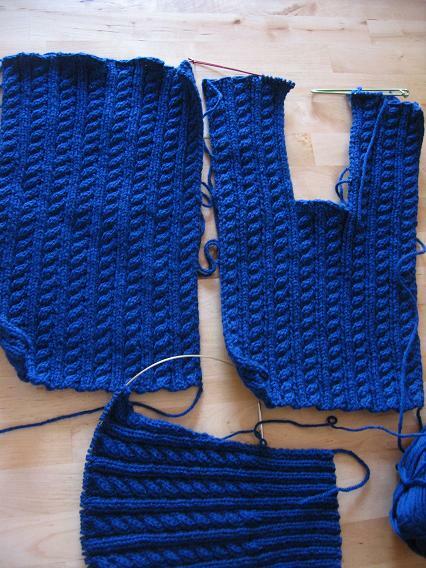 The hard part is coming up - turning those four separate pieces into one actual sweater. Wish me luck! Yesterday I cast on the bangs for the Hallowig. As usual, when I joined the round it was twisted. Somehow, I fixed it without having to Frog! Woohoo! I just might make it after all. Grrr. Or - you fall down, you get back up and keep going. I've reversed the colors. But I am SO not frogging those hard-earned rows. OK, here's the deal-e-o. I was on vacation last week. Got stuck (in the Caribbean, poor me) by snow in NYC, and only got home yesterday. I brought yarn with me on vacation to make size-13 socks for my husband, but then found out while there that he really hates the yarn. In fact, he has no interest whatsoever in having me knit anything for him. So, on Friday, instead of casting on for size-13 socks, I cast on for size ten socks for my brother (also going to be challenging to complete in sixteen days). Wanna know how far I am? I've done the toe of one toe-up sock. Mostly because I realized I love this yarn and don't want to give the socks away. I want to make them for me. But did I rip back and cast on for me? No-o. Because doing so would be changing the project *during* the olympics. And do athletes get to enter new events mid-olympics? No. So instead, panic set in and I have done nothing since, oh, Saturday evening. Not even on the plane on the way home on Monday. I'm in trouble now. But I am also re-energized by, oh, being away from the rum drinks, the pool, the beach, the warm Caribbean breezes, the vacation attitude. That, and reading all the stuff on various blogs about how others are panicking has really lighted a fire under me. Here's hoping I don't go down in flames. Or at least, if I do, that they are Olympic Flames of Glory. As members of my fan club may remember, I'm knitting the Fir Cone Square Shawl from Folk Shawls in some 1/14 cashmere from ColourMartUK in the colour "Everglades". 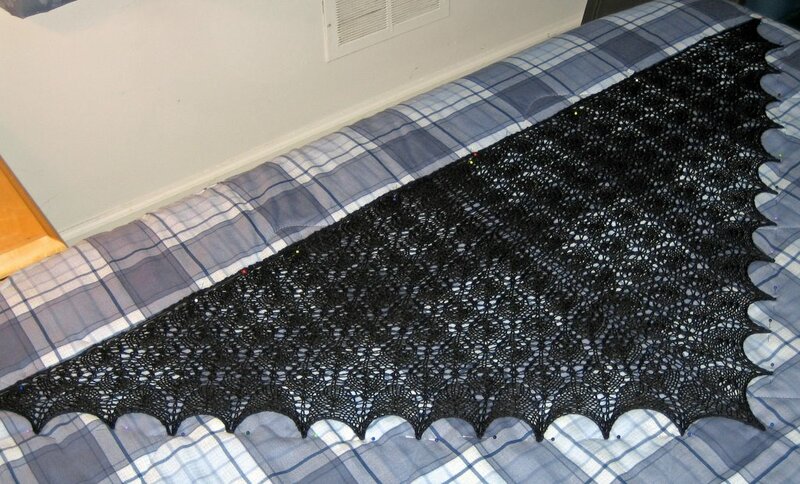 (google will show you a couple of finished shawls) The most wonderful Trillian42 made a spreadsheet for me so I could see how far through I am. So far I have been averaging about 8% a day, which is just right if I expect to have time to block this beastie. 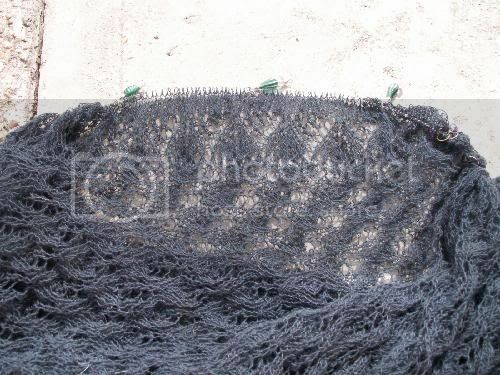 The shawl starts as a simple square; stitches are picked up from around the outside and is knit in the round from there. It's finished with a short little edging. extreme close-up of the row of picked-up stitches, eyelet round, and inner border lace pattern 1, with bonus turtlegirlicious stitch marker! Stitch markers every pattern repeat would be excessive, but I keep 4-5 every side just to keep myself on track. Yarn notes - this yarn was bought on a cone, all oiled for machine knitting. It's not too troublesome to knit with, but a bit different. I have to keep fondling my washed swatch to remind myself what it will become. 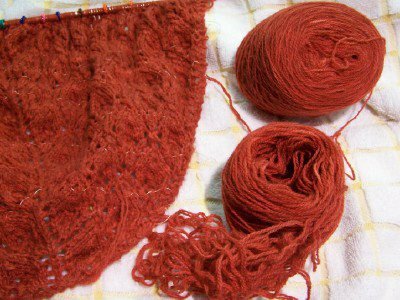 It's also single-ply, which accounts for some of the twisting shown in the pictures; I haven't knit with many single-ply laceweights before, so I'm not quite sure what I think about it. Stay tuned. 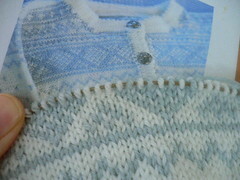 By now I have over 700 stitches per round, so it'll be slow going and not much to blog. The next 40 rounds account for about 40% of the knitting - oy! 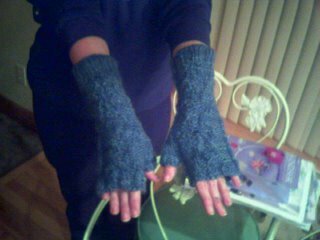 Finally, I got into a groove on those Hurry Up Spring Armwarmers. I do find that one stitch (wherein you knit through 3 stitches at once, then knit front, back, then front, to be a bit sadistic. I noticed my wrists ached last night after doing a few of those. Today, as I was surveying my work, I noticed that the pattern is appearing on the reverse side.. I was starting to worry, as it looked very wrong. 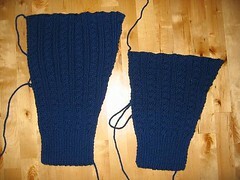 So, I'll finish up the right one, reverse the pattern and do the left one, and apparently wear them inside out... d'oh! I can't belive all the progress everyone is making! Here's a pic of my progress so far, 3 hats done, 5 to go. Yesterday I didn't knit at all for the olympics, and I feel guilty. I think I need to sneak my knitting into work today. Notice the ends aren't woven in. I hate that part. I'm saving them up to the very end. :D Knit on! 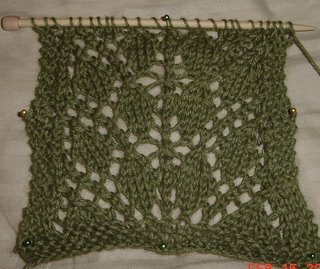 I am three whole repeats into my Branching Out - it took about 6 false starts to get this far but here I am - I just wonder if I am going to need another skein of yarn to make it a big scarf! Does anyone have a skein of Andean Silk in Lettuce that they want to donate to the cause? I have oficially crossed the finish line! 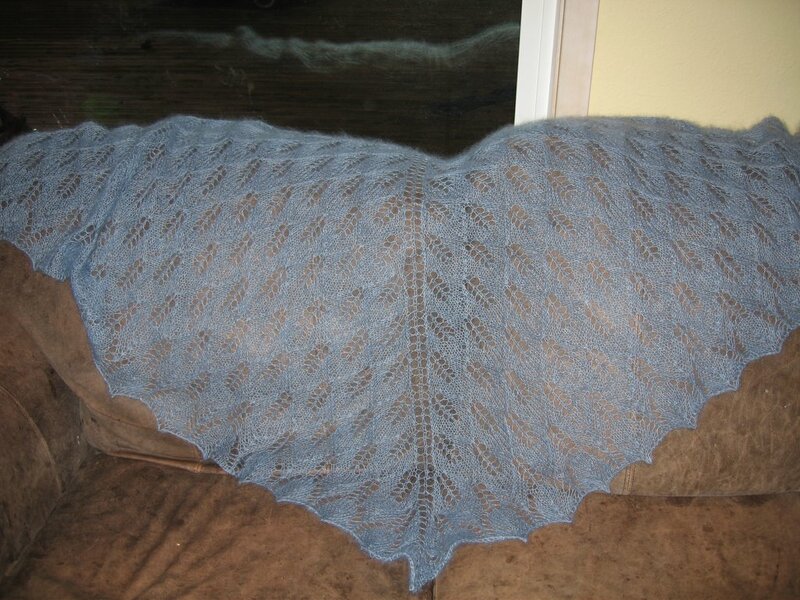 My Flower Basket Shawl is drying in the spare bedroom while DH and I have our Valentine's Day dinner. Here's a quick pic before I set the table... Isn't it GAWWWWGEOUS! I ended up doing two extra pattern repeats, and I'm so glad I made that decision. It measures 58" across, and 24" long. Perfect! Happy Valentine's Day everyone, and keep those needles clicking! I'm done the ripping and screaming stage I seem to have to go through while learning the lace repeats. Note all the lifelines. It's not a hard pattern, but those YO's near the markers are easy to miss, and it took me a while to notice the pattern isn't exactly symmetrical on both sides. 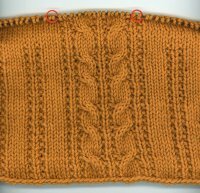 It's now halfway through the 3rd repeat of the lower chart (out of a total of 7/8 repeats, depending when my yarn runs out). I think I'm going to make it. At the Torino Olympics, I love the American Snowboard team! I was so upset when Kelly Clark washed out! I think she could have scored better. She flew so high, she could have taken on any Flying Tomatoes. Her run isn't getting enough press, it was historical!